Japan – The world-famous Nippon Budokan arena in central Tokyo played host to the Fumiya Fujii 30th Best Special Countdown Live on New Year’s Eve 2014. 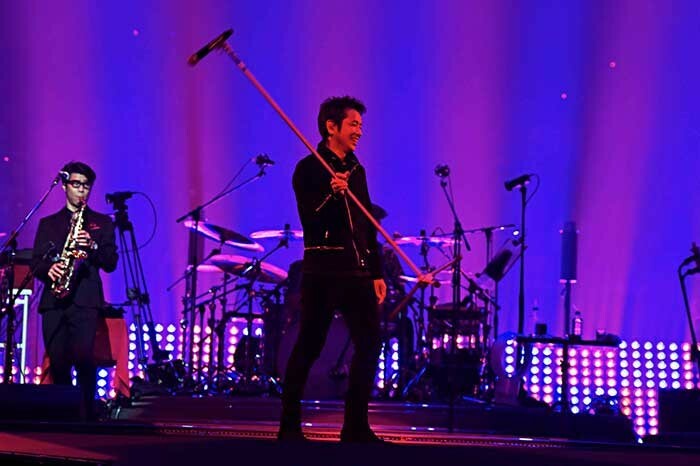 The show was the spectacular culmination of a two-year tour by popular Japanese music artist Fumiya Fujii, in celebration of his ‘double anniversary’ which marked 30 years since the recording of his debut album and his 20th year as a solo artist. 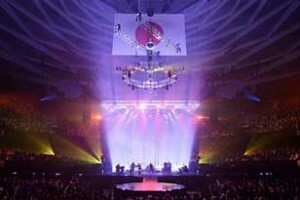 Pivotal to Keisuke Nishi’s design for the evening was a bank of 90 Ayrton IntelliPix-R LED panels supplied by Ayrton’s Japanese distributor, First Engineering Japan. IntelliPix-R is a modular beam projection panel of 25 independently controllable 4.5° LED emitters arranged in a 5 x 5 array which project graphics and media far into the air. Panels can be connected together to form a semi-transparent wall, screen or ceiling or be placed under specially designed glass using its dedicated floor installation kit to create an immensely strong projection floor that can wrap a performer in dynamic columns of light. Ayrton IntelliPix-R is suitable for indoor or outdoor use. 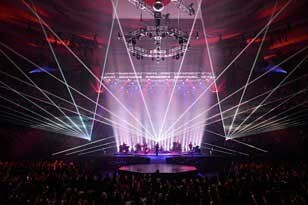 The IntelliPix-R panels were positioned on the stage deck itself, behind the musicians, and angled upward to enable Nishi to show off the full power of IntelliPix-R’s projection capacity without pointing directly into the eyes of the audience. Powerful walls of light and spectacular colour shifts were projected upwards to create dramatic aerial beam effects. These contrasted with subtler text and abstract shapes which chased across the surface of the bank of panels, created from IntelliPix-R’s individually-controlled pixels which Heart-S mapped using Avolites Media’s AI Server. The individual pixels were also used to count down the seconds until New Year 2015. Heart-S decided that Intellipix-R was the perfect fixture for this unique range of effects because of its ability to produce intense beams combined with a high degree of versatile control. Ayrton IntelliPix-R is suitable for indoor or outdoor use which makes it the perfect tool touring purposes.